The food we eat is a multi-dimensional aspect of our lives. Food provides us with the energy that enables us to grow and prosper. The act of preparing nutritious and compassionate meals is an art form in itself, and the nourishment we obtain promotes wellness within us. If you have ever prepared your own meals from scratch, with wholesome plant-based ingredients and an abundance of fresh produce, you likely understand that there is a marked difference between these foods and those that are processed and stacked on supermarket shelves. 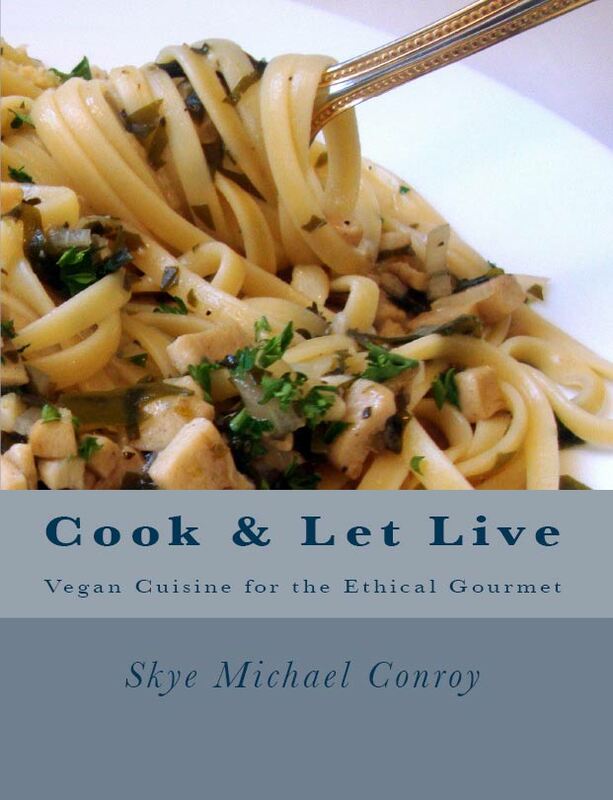 The Cook and Let Live cookbook is a culinary journey of rich and satisfying compassionate cuisine. 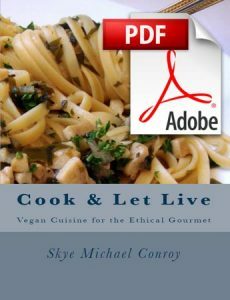 The cookbook is a text-only (no photos) recipe formulary providing detailed step-by-step instructions for creating a wide variety of vegan gourmet foods. 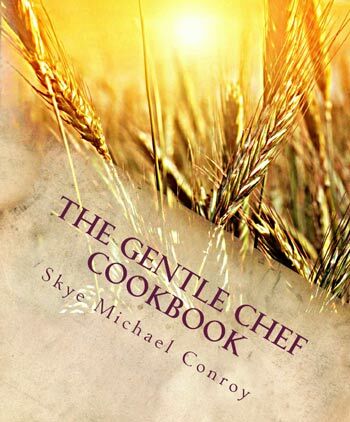 The recipes include revised and new Gentle Chef meat and seafood analogues with entrees; an expansive chapter of new and updated non-dairy butters, creams and cheeses; breakfast and brunch dishes featuring Gentle Chef Vegan Eggz Essentials; refreshing salads and dressings; tasty appetizers, dips and spreads; elegant accompaniments; comforting soups and stews; velvety sauces and gravies; and delectably sinful vegan desserts! All recipes are 100% plant-based. Order bound copy on Amazon here! Download the full color pdf of the dishes from Cook and Let Live! Join me as we embark upon a culinary ocean voyage and explore new and different ways of creating delicious vegan alternatives for a variety of sea foods and seafood dishes. 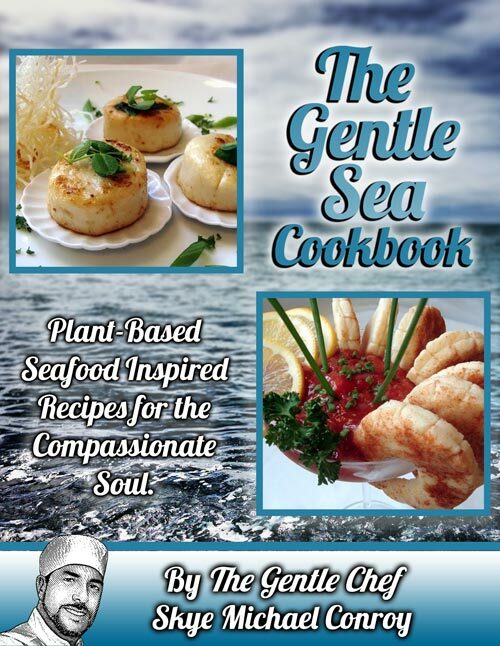 The Gentle Sea Cookbook, in full color digital format, offers unique recipes and techniques for preparing remarkable and delicious simulations of fish, scallops, shrimp, lobster, calamari, clams and more, made with wholesome plant-based ingredients and without the need for expensive factory equipment. The cookbook includes a comprehensive section of recipes devoted to vegan seafood appetizers, soups, salads and entrées, as well as seasonings, sauces and condiments. The Vegan Eggz Cookbook is a culinary guide to creating a wide variety of plant-based egg alternatives which closely approximate the aesthetic qualities of real cooked eggs and egg-based foods. 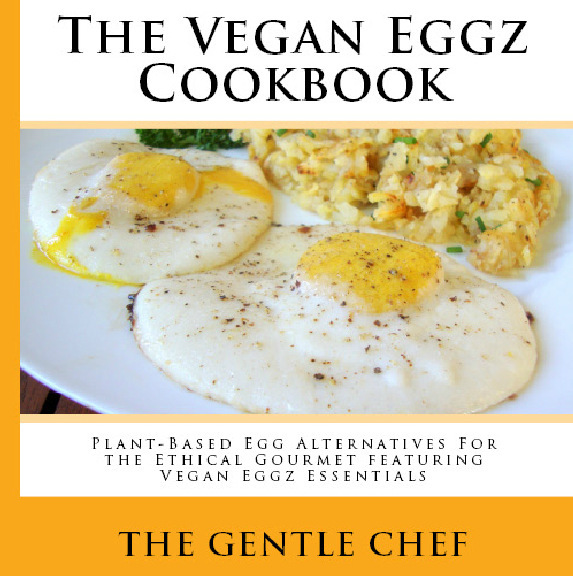 With this cookbook I am also launching “Vegan Eggz Essentials”, my first product under the Gentle Chef label. My new recipes using Vegan Eggz Essentials are the result of my quest to create home-prepared egg alternatives that have the appearance, flavor and texture of real eggs but which also can be cooked like real eggs. The exciting thing about these alternatives is that they are easily prepared using soymilk or almond milk and can be customized for different culinary purposes. The cookbook is available in digital PDF format and offers detailed step-by-step instructions with large, beautiful, full-color photos. 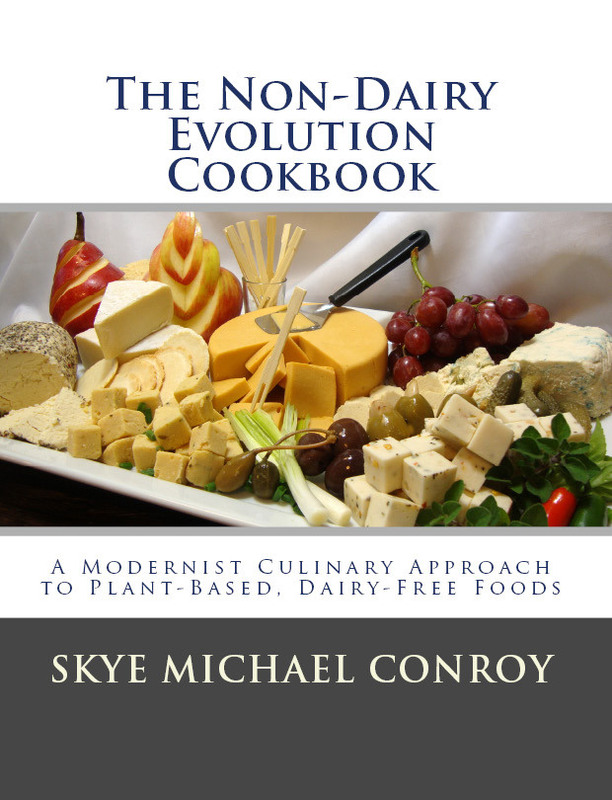 The Non-Dairy Evolution Cookbook is a follow-up to The Non-Dairy Formulary and offers new and improved plant-based, dairy-free recipes to delight your palate. It is available in both a TEXT-ONLY hardcopy format and a digital PDF format illustrated with full-color photos. Detailed step-by-step instructions are provided for creating non-dairy butter, milks and creams using a variety of plant-based ingredient options; cultured butter, cultured raw buttermilk, cultured cashew-based creams, Greek-style yogurt and sharp, tangy cultured cheeses; “instant” soymilk or almond milk-based cheeses that shred and melt; tofu-based cheeses; delicious eggless egg recipes; and delectable non-dairy desserts including gelatin-free marshmallows! Good karma never tasted so delicious! 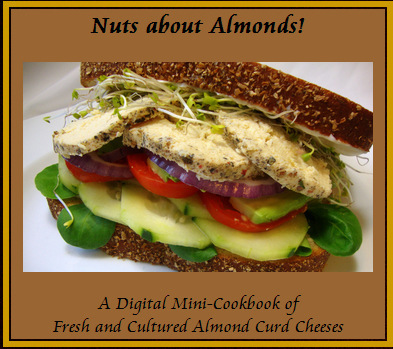 *Allergy warning: Most of the recipes in this cookbook involve soy, cashew nuts or almonds. Detailed step-by-step instructions with large, beautiful, full-color photos are provided for creating delicious, healthy, fresh and cultured almond curd cheeses. These recipes are my small contribution towards the public demand for natural, unprocessed non-dairy cheeses. All of the cheeses in this mini-cookbook, as well as my new Greek-Style Cultured Almond Yogurt, are gluten-free, soy-free, and free of added starches, gums and gels. Most of the cheeses are free of added oils, with the exception of the Greek Feta and Almond Cream Cheese which utilize refined coconut oil for texture and mouthfeel. Keep in mind that the cheeses are not simply comprised of ground nuts, nor are they made from almond milk with added thickeners. Rather, they are made from the fresh curds of almond milk. This provides an entirely different texture and mouthfeel. Many people who embrace a plant-based diet do so for ethical reasons and not because they dislike the flavor and texture of meat. But finding satisfying meat alternatives is not always easy for individuals who once enjoyed the flavors and textures associated with meat-based dishes, or for individuals who grew up with meat-based dishes as a traditional part of their family or ethnic heritage. This cookbook is an expansion of my early work with meat analogues in the Gentle Chef Cookbook. With these recipes we will explore new and different ways to approximate the texture, flavor and appearance of a wide variety of meats, meat products and seafood at home using gluten, tofu and other wholesome plant-based ingredients and without the need for expensive factory equipment. The cookbook also offers a comprehensive section of recipes devoted to essentials and incidentals needed for preparing meat analogues, as well as seasoning blends, gravies, sauces and condiments. The cookbook is now available in both a digital PDF format illustrated with beautiful full-color photos and a TEXT-ONLY hardcopy format. Click here to purchase and view the extensive photo gallery. 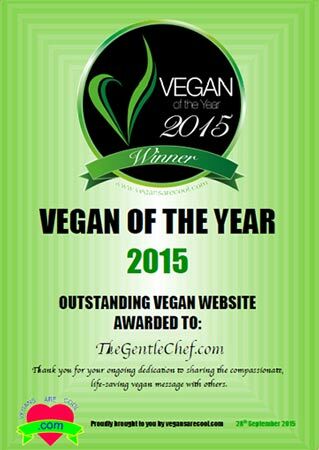 The Gentle Chef Cookbook contains over 230 delicious vegan recipes for creating a wide variety of plant-based foods. 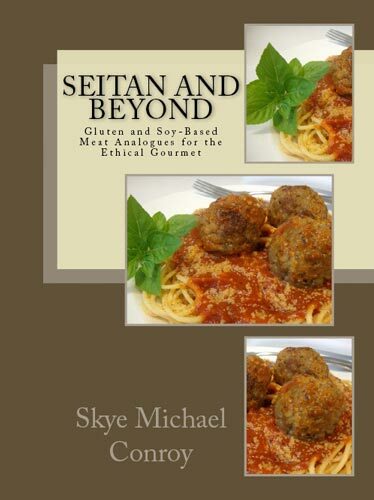 Chapter 1 offers detailed, step-by-step instructions for creating a variety of seitan products, including moist and tender roasts, sandwich deli slices, sausages, ribz, meatballs and so much more. Chapter 2 addresses the basics and preparation of the soy-based meat replacements: TVP (textured vegetable protein), tofu and tempeh. Chapter 3 offers detailed, step-by-step instructions for creating a variety of non-dairy foods including vegan butter, heavy cream, sour cream, whipped cream and an assortment of vegan cheeses. Chapters 4 through 10 offer detailed, step-by-step instructions for creating hearty breakfast and brunch dishes; appetizers, dips and spreads; sandwich fillings; American and international dinner entrees and accompaniments; soups, broths and stews; salads and dressings (including the best egg-free mayonnaise); sauces and gravies; and scrumptious vegan desserts. The cookbook is available in both a TEXT-ONLY hardcopy format and an illustrated digital PDF format. *Allergy warning: Many of the recipes in this cookbook involve gluten, soy products and tree nuts. 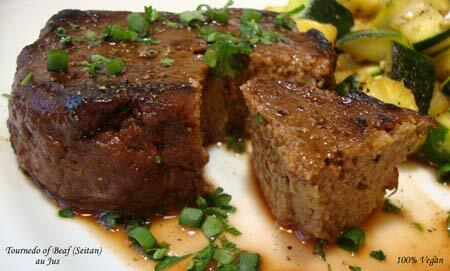 Abstaining from meat is easy for individuals who have always had an aversion to meat. However, it’s not always easy for individuals who once enjoyed the flavors and textures associated with meat-based dishes or for individuals who grew up with meat-based dishes as a traditional part of their family or ethnic heritage. The reality is that we live in a meat-centric society and many of us grew up on a diet of meat. This learned behavior is constantly reinforced within every aspect of our culture. It takes time to rewire our brains into accepting change, especially for those who perhaps never cared for vegetables and “health food” in the first place… Click here to read more. 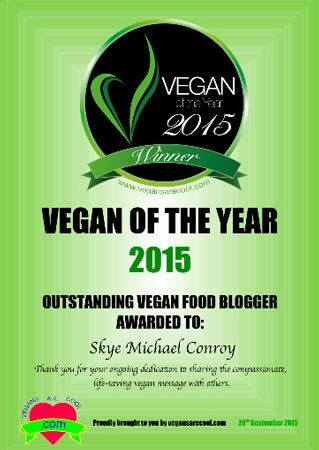 I am truly honored to receive such wonderful awards. Thank you to everyone who has supported me over the years! Together we are changing the world!